Great Yarmouth Norfolk. Vintage BR ER Travel poster by Bagley. 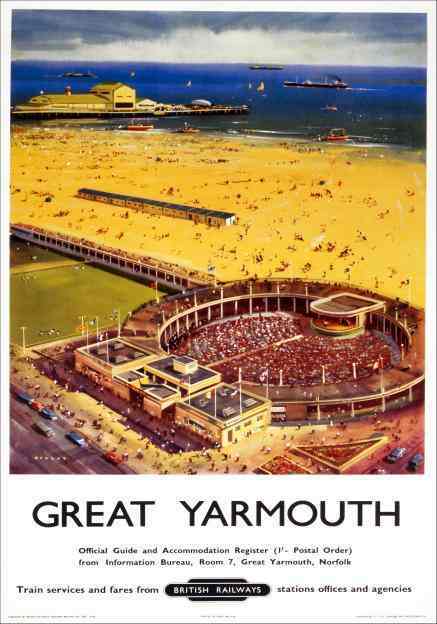 Vintage travel poster produced for British Railways (BR) Eastern Region (ER), promoting rail travel to the Norfolk seaside resort of Great Yarmouth, showing an aerial view of the beach, sea and the Britannia Pier, with the Marina Open Air Theatre in the foreground. The theatre was built in 1937 but was demolished in 1979 to make way for a new seafront leisure complex. Artwork by Bagley. Printed by Jordison & Co Ltd, London & Middlesbrough.